WHO meeting to discuss Ebola therapy Jump to media player The World Health Organisation (WHO) is meeting in Geneva to discuss experimental therapies to combat the Ebola outbreak. Ebola 'attacking way of life' Jump to media player Lewis Brown, Liberian minister of information, discusses the prevention techniques being used in Liberia to prevent the spread of Ebola. Ebola outbreak 'presents challenges' Jump to media player Dr Stephan Monroe from the US Centers for Disease Control and Prevention says the latest Ebola outbreak was unusual. 'I survived Ebola outbreak' Jump to media player Saa Sabas, 41, caught Ebola from a relative but recovered. Nigeria takes Ebola precautions Jump to media player Nigerian authorities have taken a range of measures after a man died of the Ebola virus in Lagos. Ebola 'catastrophic' for Liberia Jump to media player The Ebola crisis in west Africa is "catastrophic" the president of Liberia has told the BBC. The United Nations says Ebola infections will treble to 20,000 by November if more is not done. US based Centre for Disease Control say that in the worst case scenario, infections in Liberia and Sierra Leone could reach 1.4 million by January. More than 2,800 people have died so far - making this the largest ever Ebola outbreak. So how is the disease affecting family life? 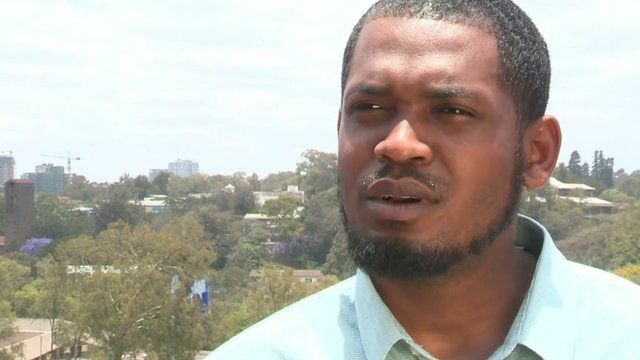 Abba Abashi a Liberian-Nigerian student in the Kenyan capital Nairobi has been speaking with the BBC about his efforts to maintain contact with family members in Liberia.